Built to withstand sub-zero temperatures to extreme heat, weather-proof containers prevent the outside elements from damaging stored contents. 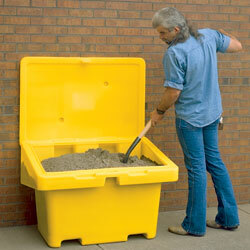 Because polyethylene containers are completely moisture-resistant and weather-proof, they are ideal for storing rock salt, sand or grit. Resist rust, dents, and corrosion. Hinged locking lid closes securely keeping out rain and snow (padlock not included). Containers nest when lid is raised. SPECIFY COLOR: LG - Lt. gray, YL - Yellow. Other colors are available, call for information. IN STOCK. WF-2000LG 35	 Light gray	 500	 5-1/2	 30" x 24" x 23"
WF-2000YL 35	 Yellow	 500	 5-1/2	 30" x 24" x 23"
WF-2001LG 50	 Light gray	 1000	 11	 42" x 29" x 30"
WF-2001YL 50	 Yellow	 1000	 11	 42" x 29" x 30"
WF-2002LG 65	 Light gray	 1750	 18-1/2	 48" x 33" x 34"
WF-2002YL 65	 Yellow	 1750	 18-1/2	 48" x 33" x 34"
WF-2003LG 50	 Light gray	 3600	 11	 72" x 36" x 36"
WF-2003YL 84	 Yellow	 3600	 36	 72" x 36" x 36"